Appalachian State vs. UL-Lafayette College Football Free Pick, a prediction on who will win this Sun Belt showdown between the Mountaineers and Ragin’ Cajuns. Both teams are coming off a bye week and this will be the third head-to-head meeting ever. 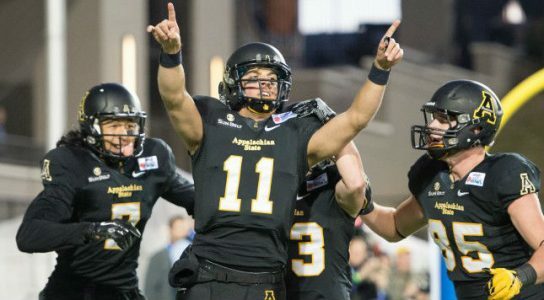 App State opened as a 10,5-point favorite but at the publication of this football free pick they were down to -10 despite catching nearly 70 percent of the tickets. This is an indication of the sharp money backing the Ragin’ Cajuns. The total has dropped a point from the opener of 49.5 which is a much lower number than when these programs have faced off in previous years. The Mountaineers are coming into the game with a 3-2 record. They are 1-1 on the road but have covered the spread in both games and are 6-1 ATS in their last seven road games with last season included. The Mountaineers stood for a solid defensive performance in a 17-3 home victory against Georgia State on October 1, but it was far from the dominant performance the result would suggest. They led by just a touchdown with less than 10 minutes to go in the 4th quarter, and they failed to cover the spread as a hefty 18.5-point favorite. The total was set at 51.5 points and went under by quite some margin. The Ragin’ Cajuns come in off back-to-back overtime defeats to a pair of poor teams in Tulane and New Mexico State. They have a 2-3 record overall and are 2-1 both straight up and ATS home at Cajun Field. The Ragin’ Cajuns are 4-1 ATS in their last five home games vs. a team with a winning road record including last season’s results. The bye week must have come at a good time for UL-Lafayette who fell 37-31 as a 5.5-point favorite at New Mexico State just about 10 days ago. The game went over the total by half a point and the Ragin’ Cajuns defense has had a lot of holes all season long allowing 33.6 points per game. App State has won both the previous meetings, 35-16 back in 2014 and 28-7 as a healthy 22.5-point favorite at home last year. Both games went under the total with the lines set at 62.5 and 58.5 points respectively. The Ragin’ Cajuns are 15-5 in their last 20 at home against Sun Belt teams, but they clearly struggle with App State. The Mountaineers QB Taylor Lamb should throw plenty of yards against a pass defense that ranks dead last in the conference and Louisiana-Lafayette does not have the necessary firepower on the offensive side of the ball to make up for that.